Not only does pesantren (a term used to refer to an Islamic boarding school) instill a religious spirit, but it also interprets Indonesia based on the spirit of nationalism. Therefore, it is not surprising if later pesantren is presented in an attempt to dedicate itself to the nation and the state of Indonesia besides in the interests of Islam definitely. In addition to education, educational institutions such as pesantren also have socio-cultural functions and duties. Thus, a significant spiritual movement needs to be created in order to strengthen empowerment intended to provide education holistically. Among the tool to facilitate instructional processes is the mastery of Arabic. This paper describes the practices of teaching and learning Arabic among Muslim minorities using the approach of the principles of modernity. This research was conducted in West Papua, which covered five regencies and one city. Findings of the research suggest that instruction in a number of pesantren in Mayamuk, Aimas, Waisai, Teminabuan, Kaimana, Waigom, and Misol, was carried out in a structured manner. In those seven locations, Islamic education which adopted a language skill-based instructional framework was carried out by employing a communicative approach among santri (i.e. a term used to refer to students who go to pesantren). The skill developed among santri was language expression without any special emphasis on the mastery of grammar. The environment of pesantren equipped with a boarding school for santri as a place to stay facilitated interactions among santri to practice their language skills. Their language skills were adjusted to the learning context and the accompanying environment. The existing social aspects were then used to facilitate the learning process. Finally, this research draws conclusions that differences in learning objectives which determine the aspects of the approach and methodology affect Arabic instruction. WEKKE, Ismail Suardi. Arabic Teaching and Learning on Construction of Modern Instruction in Muslim Minority Pesantren Society. Edukasia Islamika: Jurnal Pendidikan Islam, [S.l. ], v. 3, n. 1, p. 33-53, june 2018. ISSN 2548-5822. 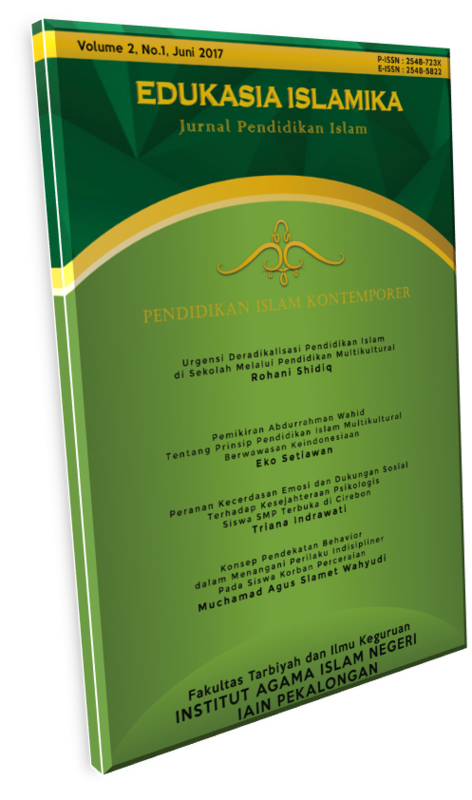 Available at: <http://e-journal.iainpekalongan.ac.id/index.php/edukasiaislamika/article/view/1300>. Date accessed: 22 apr. 2019. doi: https://doi.org/10.28918/jei.v3i1.1300.